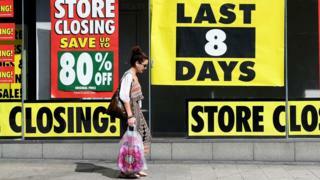 UK retail sales fell "off a cliff" in April, although the figures were distorted by the timing of Easter. The British Retail Consortium (BRC) said like-for-like sales, which strip out the effect of new store openings, fell by 4.2% compared with April 2017. Total sales were 3.1% down year-on-year, the sharpest fall since the BRC started collecting data 23 years ago. While a lot of Easter spending was done in late March, not April, the figures were still worrying, the BRC said. The industry body has been publishing its monthly BRC-KPMG retail sales monitor since January 1995. Helen Dickinson, the BRC's chief executive said: "A drop in sales this April... was almost inevitable given the earlier timing of Easter. With much of the spending in preparation for the Bank Holiday weekend falling in March this year, a record low in sales growth, in contrast to last year's record high, does not come as a surprise. "However, even once we take account of these seasonal distortions, the underlying trend in sales growth is heading downwards," she said. Fashion sales rose, according to the data, but food and grocery fell. Ms Dickinson said: "The first glimpse of summer may have temporarily lifted clothing and footwear, but non-food sales overall continue to be weak. "Consumers' discretionary spending power remains under pressure and the reality is, that with only a gradual return to solid growth in real incomes expected, the market environment is likely to remain extremely challenging for most retailers." Richard Lim, chief executive of Retail Economics, said the figures underline why retailers are struggling and several have announced closures and restructurings. "Consumers' propensity to spend remains weak with households cutting back on discretionary purchases," Mr Lim said. "Clearly, all is not well on the High Street and challenging conditions look set to remain for the rest of the year."